It all started with a sore throat on Saturday (11/17) evening and it escalated from there. By the time Thanksgiving (11/22) rolled around I woke up feeling pretty bad, and to ensure I didn’t pass my sickness along to my family, Joe made the sides we brought with us to dinner – cranberry sauce, green bean casserole, and sweet potato casserole. I finally gave in and tried a netipot which actually helped a lot, even IF I did have a minor meltdown thinking maybe something was growing in the distilled water jug which had been open for a few months. And the kicker? The following day I discovered an unopened jug in the pantry! Ugh! Anyway, we had the Macy’s Thanksgiving Day Parade on in the background while we perused sale ads. They really do tempt you to buy stuff you don’t need. That being said, we’re considering getting a soundbar for the TV and getting rid of the 7-piece system we have now that we rarely use. Most likely we’ll make that purchase at Costco so we can easily return it if we change our minds. After the parade we watched the National Dog Show before getting ready to head to my parents’ house. We arrived just before 5 but B didn’t get there until 6:15 well after we had eaten dinner and dessert. R didn’t accompany him, though. My mom decided that this year for Christmas we’ll be doing a Secret Santa exchange so we drew names for that. I got J and Joe got R… and I think R got me but I’m not positive. Either way it should be interesting. We played a game of Aggravation before taking off just after 9 pm. Despite getting home at a reasonable time I didn’t get to sleep until nearly 1 am and then couldn’t sleep past 5:30 am. The joys of being sick! I did feel much better compared to the day before, at least. I had finished all the day and night medicine on Thursday and decided not to buy any more unless absolutely necessary. Friday (11/23) I made a candied apple pie cheesecake, oatmeal chocolate chip cookies (Betty Crocker which were not nearly as good as my homemade ones), and we also had a pumpkin pie we got from Target. We brought it to my parents but only B took a piece. Right before putting the turkey in the oven, we ran to Walgreens for some 2-liters of soda and I found a cute silver bottle brush tree and a pack of three pair of fuzzy socks (which are turning out to be awesome) while Joe got some beer at a great deal. My items rang up 30% off thanks to a coupon in the Walgreens app which was nice. I have a whole silver theme I’m planning for the decor this year which includes trees and a really cute reindeer I found at Home Goods recently. I think we’ll be decorating the house for Christmas NEXT weekend, however. The kids arrived just after 5 pm. E brought his girlfriend but K didn’t bring her boyfriend because he’s sick. We had turkey, gravy, stuffing, sweet potato casserole, green bean casserole, corn, mashed potatoes (which E devoured like usual), crescent rolls, and cranberry sauce. I didn’t really care for my cheesecake (and none of the kids wanted to try it), so I won’t be making that again. E did have some of the oatmeal chocolate chip cookies even though they were inferior to mine. Hopefully I won’t be too sick on Christmas to make those since they are a big hit. I’ll probably make the chocolate peanut butter pie I made for Joe’s birthday as well. And I need to make macaroni and cheese since E was disappointed it was missing. We played Aggravation and Uno Attack before everyone took off around 9:30 pm. Saturday (11/24) was a lazy day, for me anyway. Still wasn’t feeling 100%. Joe swapped my car’s floormats, removed the pathway lights for the season, covered the A/C unit outside, and put up the Christmas lights. We ran to Aldi for some bread (gotta make turkey sandwiches with the leftovers) and to Costco in the late afternoon to get gas for my car and pick up allergy meds (an entire year’s worth of generic Zyrtec for $14? Yes please!). We also wanted a rotisserie chicken but they were completely out! I grabbed a set of three silicone baking mats for $13 that I had been eyeing for awhile, though. I like that there’s markings for baking cookies and the small one fits in the toaster oven since we use that to bake salmon twice a month. 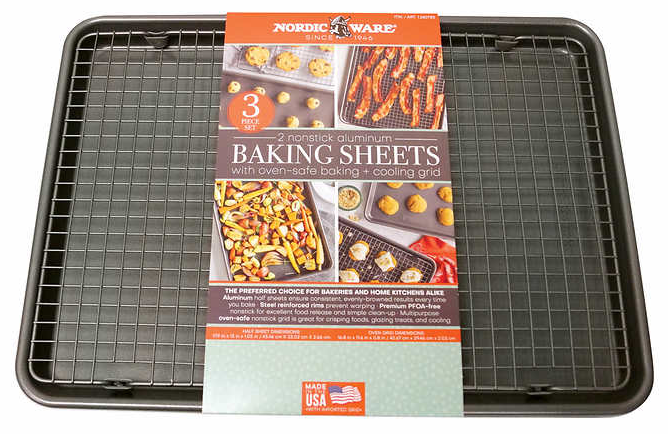 I also got a set of aluminum baking sheets with an oven-safe baking and cooling grid for $20. I think it would be great for making bacon without it sitting in it’s own grease. It would probably be great for baking chicken too after seeing it done that way on FlavCity, my latest obsession. We looked at their soundbars but can’t seem to pull the trigger. We don’t want to pay too much since we don’t really need one, plus I’d like to stick with Samsung since it would work best with our TV, also a Samsung, but their bar is rather ugly with a hard plastic exterior. On top of that, it has a little display screen in the middle which I think looks stupid. So for now we’re going to wait until we see something we really like. Saturday night after watching Incredibles 2 (1st viewing for Joe and 2nd viewing for myself, which I enjoyed even more), I decided on a whim to check out the Netflix mini-series, The Haunting of Hill House. Oh… my… god… was it good! So good, in fact, I was cursing the fact that we started it at 9 pm because I didn’t want to turn it off to go to sleep. I managed to grow some semblance of will power and turned it off after episode 3. We picked it up on Sunday afternoon and finished the entire series that day. I wasn’t entirely pleased with how they chose to end it, but overall it was one of the best things I’ve seen in a long time and I highly recommend it even if you’re not into horror (which I am not). The only other thing we really did on Sunday (11/25) was go shopping in the morning at Walmart. I found a pair of soft fleece Christmas leggings to add to my collection (it has penguins on them and who can pass that up) which brings me to three pair for the holiday season. I also discovered they are selling fur-lined leggings in black but they didn’t have my size so I’m going to have to check again next weekend. Haven’t done much today (11/26) other than my usual upstairs cleaning. I glanced at the Cyber Monday deals but nothing really moves me. We’re considering getting a cheap Chromebook, but we’re not even sure about that. Joe would like a new laptop so he can start playing Warcraft again but would need to spend at least $800 for a decent machine which he doesn’t want to do. Which is funny, when you think about it, because we can totally afford it. I don’t know what happened, but I feel like the more money we have the less we want to spend it, at least when it comes to stuff we want but don’t need. I’ve been hanging onto my iPhone 6 going on four years now even though I could easily buy the biggest most expensive new phone Apple has to offer. But I just don’t want to, at least not yet. Next year, definitely, because at some point the phone just won’t work well. 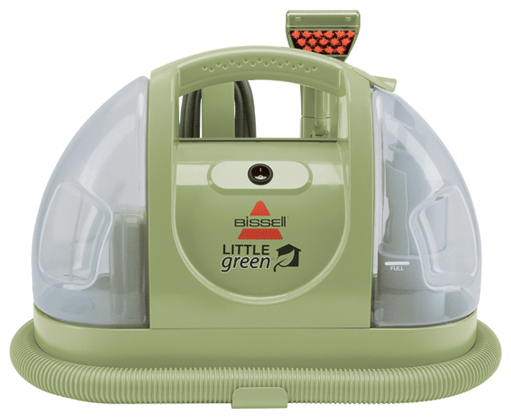 I did, however, buy this Bissell Little Green Portable Carpet Cleaner on Thanksgiving from Amazon since it was on sale for $60 (list price is typically $90). Wookie keeps vomiting on the rug which I always spot clean as best as I can but I need something that can really wash it thoroughly. It was delivered yesterday so I’m going to try it out today. Cross your fingers it gets the color of the carpet back to normal!